08:55 Hello and welcome to AUTOSPORT Live for coverage and rolling updates from round 18 of this year's FIA Formula 1 world championship - the Abu Dhabi Grand Prix weekend at the 5.554km Yas Marina circuit. Sebastian Vettel arrives in the Middle East on a staggering run of form that is making him look difficult to beat. Another victory at the Indian Grand Prix five days ago extended his points lead over Fernando Alonso to 13 and clearly we are down to a two horse title race. However, Ferrari's performance last weekend was much closer to the flying Red Bull drivers, with Alonso getting in among Vettel and his team-mate Mark Webber. This will give the tifosi some hope, but the Spaniard really does need to keep the pressure on - and if possible try to reverse what will be a concerning trend. As always, we start the event off with first practice and you can expect the usual round of installation laps and constant speed aero tests, before the teams spend the second half of the 90-minute session finding a solid baseline set-up to use as a platform for the rest of the weekend. 08:57 Conditions are fine and dry around Abu Dhabi this afternoon, with blue skies and plenty of strong sunshine for this first session. A light breeze is blowing from the north, while air temperature is up around today's projected maximum of 31 degrees. We expect a maximum track temperature of approximately 42 Celsius during practice one, before the values begin to dip during this evening's twilight session. 08:57 Max Chilton makes his race weekend debut for Marussia here, taking over from Pic for the first session. 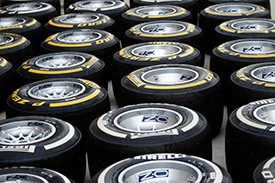 08:58 Soft and medium compound tyres are on offer this weekend. "We know that the combination of the medium and the soft tyre works extremely well here," said Pirelli motorsport director Paul Hembery. "With the teams also having plenty of data about the circuit characteristics, they should be in a strong position to construct some race strategies that will make a real difference to the outcome of the weekend." 08:58 Giedo van der Garde is having another outing for Caterham, this time replacing Petrov for a chance to test the upgraded car. 08:58 Air and track temperature are one click higher than anticipated, with an ambient of 32 Celsius and 43 degrees down on the circuit. 08:59 Jules Bianchi will gather data for Force India, while Paul di Resta sits out the first session. 08:59 The impressive Valtteri Bottas is again at the wheel of the Williams, in place of Bruno Senna. 0 min: Raikkonen is the first man out of the pits today in his Lotus. 0 min: While Ma Qing Hua gets another turn at the controls of the HRT, as Narain Karthikeyan watches on from the pitwall. 1 min: Vergne - recently announced with team-mate Ricciardo at Toro Rosso for 2013 - heads out to check over this year's car. 1 min: Hua is on track to run through an installation check for HRT. 1 min: Bianchi, Bottas, Hulkenberg, Webber, Maldonado, Ricciardo, Vettel and de la Rosa are also on track to check the basic functions on their cars. 2 min: Vergne is the first to complete his installation lap. He brings the Toro Rosso back in for checks. 3 min: Alonso and Massa are now on track to check over the Ferraris. 3 min: Michael Schumacher is on track for a checking run. Last weekend the Mercedes drivers completed two laps to kick-start the event. 4 min: Rosberg joins his team-mate on track, with more than half the field already back in at the end of one lap. 4 min: Hamilton pits his McLaren for the team to check over the car. 4 min: Webber brought his RB8 into the pitbox, completed a burnout to lay some rubber down and has rejoined the circuit. 5 min: Vettel does likewise and is out there to join the Australian. 5 min: Massa has continued into a second lap in his Ferrari. 7 min: Red Bull drivers Vettel and Webber complete their second single tour and come back into the pits. 7 min: Kobayashi is the last man to head out for a checking lap today. 8 min: Schumacher and Rosberg have completed a similar installation run to the Red Bull pair - two laps split with a pitlane run-through. 8 min: Kovalainen completes a second lap with his Caterham, which features extensive updates this weekend. 9 min: Schumacher emerges to begin his third tour in the Mercedes. 10 min: Plenty of initial work going on around Webber's machine, as the team pick the bones out of the installation run. All routine of course. 10 min: Glock is ready to return to the track in his Marussia. 10 min: In the back of the garages, telemetry analysts are examining the data following these important checking runs. 11 min: Ferrari mechanics tweak Alonso's car as the team deploy a range of updates to see if the gap to Red Bull can be closed. 11 min: Once they are happy that all is okay, they will signal to the respective race engineers for each car that it is fine to continue with the planned programme. 13 min: Alonso is sent out to test the new Ferrari parts while Chilton is also starting his first proper run in the Marussia. 14 min: Mark Webber is watching carefully, as the mechanics continue to fettle his RB8, in preparation for a run on the circuit once the track has cleaned up a little. 16 min: Chilton is working on aerodynamic testing for Marussia with some constant-speed tests down the long straights. 16 min: Hulkenberg is advised over the team radio that there will be a delay of around six minutes, while the mechanics change some wiring. 17 min: Ma Qing Hua joins the circuit for an early run in the HRT. 18 min: A 2m27.380s lap is recorded by Chilton as he tours around to complete the test programme. 19 min: Hua crosses the start-finish line and begins what should be his first timed lap of the session, as he gathers data for the team. 20 min: Hua is heard running up and down through the gears as he works through some checks. 21 min: Track temperature continues to climb and is up to 45 degrees Celsius. That is possibly a record for a Formula 1 track session at this venue. 23 min: It's a battle to be slowest as the test drivers complete checks. Hua also comes round in 2m27s, slotting in four-tenths behind Chilton. 23 min: With the wiring changed on his Force India, Hulkenberg is out there for a run. 24 min: Just one tour for the young German and he returns to the pitlane. 24 min: The circuit is empty for the time being, with only two timed recorded and 24 minutes of the session gone. 25 min: Chilton is being asked to hit the rev limiter in his Marussia as he heads out for another series of tests. 26 min: Jean-Eric Vergne heads out for a run in the Toro Rosso. 27 min: Vergne crosses the start-finish line and begins a timed lap. 29 min: The Frenchman comes through in 1m48.885s to at least give the pack something to aim at. 30 min: Pastor Maldonado is on track for Williams, with Vergne on his way to a much better time. 31 min: Vergne lowers his mark to 1m47.117s as he continues with this first serious run of laps. 31 min: Bottas joins Maldonado on track and several drivers are moving towards their cars now. 31 min: Perez is now heading out for a run in his Sauber. 33 min: Vergne completes his third timed lap in 1m46.708s, finding four-tenths of a second that time round. 34 min: Maldonado slots into second spot at the completion of his first effort - 1m47.847s. 35 min: Perez joins the order in fourth fastest with a 1m48.731s tour. 35 min: At his first attempt, Bottas is half-a-second quicker than Maldonado, clocking 1m47.308s to go second, behind Vergne. 37 min: Hulkenberg completed one lap, came back into the pits and reported that his seat was getting very hot. The team quickly checked his cockpit over and sent him back out. 37 min: Raikkonen, Grosjean, Kovalainen and Kobayashi all set off as teams finally think the time is right for some early outings. 37 min: Meantime, Bottas has taken over at the front with a time of 1m46.085s. 38 min: Maldonado comes round to complete another timed lap and moves into second spot with 1m46.406s. 38 min: Bianchi is on the board in sixth place with an initial effort of 1m51.674s. 38 min: Raikkonen slots in fifth fastest with an opening effort of 1m48.687s. 39 min: Ricciardo, de la Rosa, Schumacher and Rosberg are now on the circuit for a first serious run. 40 min: Bianchi improves to fifth spot after clocking a lap of 1m46.953s. 40 min: Bottas improves his time and moves further away from team-mate Maldonado with 1m45.602s. 41 min: Maldonado crosses the line to complete another lap, but does not improve. He still lies second, with the gap up to 0.804s. 41 min: Schumacher's initial effort is a time of 1m48.403s. He is eighth in the classification. 42 min: Massa clocks 1m46.399s lap to take third fastest, which is then grabbed by Raikkonen in 1m46.237s. 42 min: Schumacher is demonstrating his rallycross skills as he completes the second timed lap in 1m47.961s. He has slipped to ninth. 43 min: Bianchi moves into second spot with a time of 1m46.221s. 43 min: Massa improves to 1m46.048s to take second fastest in these early times. 44 min: Bottas was looking set to improve, but the Finn backs off due to traffic. He remains on top by 0.446s. 44 min: Grosjean clocks a 1m45.998s lap to take second fastest as he laps with flow-vis paint on the Lotus. 44 min: Rosberg moves into third position with a time of 1m45.997s in the Mercedes. 45 min: With just over half the session gone, Valtteri Bottas leads the field with a lap of 1m45.602s, ahead of Bianchi, Perez, Rosberg and Grosjean. 46 min: But Schumacher changes all that after finally getting a clean lap. He goes quickest with 1m45.309s. 47 min: Alonso joins the order in fourth fastest as he gets up to speed in the Ferrari. 47 min: Vettel heads out to begin his first meaningful run of the weekend. Webber is into a timed lap in the sister car. 47 min: Van der Garde is still on the sidelines at Caterham as extensive work continues to fettle his car. 48 min: Webber slots into 13th position, after completing a building lap of 1m47.920s. 49 min: Schumacher is back into the pits for changes after completing his first proper run. He leads the pack, 0.092s clear of Bottas, then comes Bianchi and Alonso. 50 min: Alonso clocks a 1m45.099s in the updated Ferrari to take over at the top of the times. 50 min: Webber was looking set to improve on his second timed lap, but he subsequently backed off. He continues round to start another lap. 51 min: Hamilton is now on track for McLaren and sets the fastest middle sector time. 52 min: Vettel is into 11th place with a lap of 1m46.277s, but a gradual building process is nothing new here. 52 min: A 1m45.322s is Hamilton's first effort, putting him third fastest. 52 min: Webber moves up several spots to 10th place with a lap of 1m46.013s. 53 min: Vettel increases his pace and is up to fifth with 1m45.402s, 0.303s off the leading pace. 54 min: Hamilton, who has a strong record at this venue, tops all three seconds to take the benchmark to 1m44.001s, over a second quicker. 54 min: Hulkenberg heads out after changes in the cockpit. As if it isn't hot enough in Abu Dhabi, without having a boiling seat to deal with. 54 min: Button is also looking happy with his McLaren as he tops the first sector time. 55 min: Vettel moves up to second spot, 0.642s down on new pacesetter Hamilton with a lap of 1m44.643s. 55 min: Spanners still out at Caterham but the team look like getting van der Garde underway again soon after engine issues since the installation. 56 min: Button ends his lap in 1m44.148s to make it a McLaren one-two at the top of the order. 56 min: Bottas is back out for another run in the Williams. The early pacesetter has slipped to sixth in the classification. 58 min: Webber completes a better lap and moves up to fourth with 1m44.931s. He is 1.482s down on Hamilton. 58 min: Hulkenberg completed his first timed lap of the weekend in 1m47.737s. 59 min: All back together at Caterham and van der Garde is on track, along with Glock who has been garaged for a while at Marussia. 59 min: Hulkenberg's second timed lap is much better. He is into the top 10 with 1m45.587s, two-tenths clear of team-mate Bianchi. 60 min: Button clocks 1m44.034s, closing to just over half a second off Hamilton's latest 1m43.449s benchmark. 60 min: Vettel comes round with an improved 1m44.050s. He remains third but now 0.601s down on the benchmark. 61 min: Webber betters his time with 1m44.542s. He remains in fourth but just over one second down on the leading pace now. 63 min: Another quick one from Hamilton as he tops all the sectors again for a new best of 1m43.285s. 64 min: Michael Schumacher moves back up the list to fifth spot with a lap of 1m44.952s. 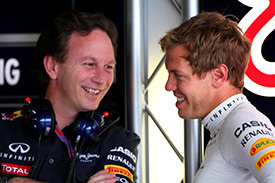 He is behind the two McLaren and two Red Bull drivers. 65 min: Schumacher continues round on a slow lap, getting in the way of Glock in the process. The Marussia driver is less than pleased. 66 min: Once he realised his error, Schumacher apologised, but the lap was lost for his fellow-German. 66 min: Glock is testing flow-vis on the rear wing of his Marussia and has been debating track position with a resuming Schumacher. 67 min: Rosberg emerges after a lengthy period in the garage. He is into the first timed lap on this run. 67 min: Raikkonen improves his best to a 1m45.422s for eighth fastest. 68 min: Rosberg records a time of 1m45.610s and moves up to 11th spot. 70 min: Ma Qing Hua has spent much of the session gathering data so far, but now HRT has released him and he is gradually improving his pace. 70 min: Raikkonen pits his Lotus as the Pirelli engineers examine his right rear tyre with concerns over a possible slow puncture. 72 min: Alonso clocks his best at 1m44.974s but remains in sixth, almost 1.7s off Hamilton's benchmark. 72 min: Hua wraps up his latest run with a two-second deficit to team-mate de la Rosa, with a best time of 1m50.800s. 74 min: Alonso pits his updated Ferrari, giving the team a chance to analyse the data collected on that run. 76 min: Hamilton and Button head out again, with McLaren setting the pace in this session so far. 76 min: Rosberg has continued his gradual progress. He is up to ninth with a time of 1m45.361s. That is just under four-tenths down on team-mate Schumacher. 77 min: Another lap for Rosberg and he is into seventh spot with 1m45.194s, and looking set to improve again on the following tour. 78 min: But Rosberg backs off in the final section. He does elect to stay out there and starts another effort. 80 min: Hamilton is told he should expect mid 1m45s times on his latest outing, which is clearly with a heavy fuel load onboard the McLaren. 81 min: Vettel is back out there and explores the limits at Turn 17. He takes to the striped asphalt run-off area and rejoins without any issue. 83 min: Button remains on a light fuel load with his McLaren as he finds more in his medium compound to clock 1m43.748s. 84 min: Van der Garde remains in the Caterham garage with only three installation attempts on the board today after engine drama. 84 min: Schumacher is back out for a final run. He remains in fifth place with a best time of 1m44.952s thus far. 86 min: Raikkonen is also stuck in the garage at the end of this session with a right rear puncture on his allocated tyres. 88 min: Button tops the middle sector but backs off at the end of the lap. 89 min: Pacesetter Hamilton continues his long run with a heavy McLaren, getting in an early evaluation of race durability on the medium compound. 89 min: Ma Qing Hua has improved with a lap of 1m50.487s, but that still leaves him 2.2 seconds down on team-mate de la Rosa. 89 min: The flag is out on first practice at Yas Marina. 10:30 Button makes a late improvement to 1m43.618s, closing to just over three tenths off Hamilton's benchmark. 10:31 Alonso clocks 1m44.466s to end the session in fourth fastest, a second slower than Hamilton. 10:31 Maldonado improves with his last lap of the session, moving up to seventh with a time of 1m45.115s. 10:33 Drivers are being allowed to practice starts from a grid, with the usual launch rehearsal from pitlane not possible thanks to the tunnel. 10:33 Lewis Hamilton tops first practice at Yas Marina with a benchmark time of 1m43.285s, ahead of team-mate Button, Vettel and Alonso. 10:34 Webber was demoted to fifth by the Spaniard at the end, with Schumacher sixth, Maldonado seventh and Rosberg in eighth spot. 10:35 Bottas produced another solid display in ninth position and Kimi Raikkonen rounds out the top 10 for Lotus. 10:36 Other notables: Massa was 11th in the second Ferrari, while Hulkenberg recovered to 12th position, following his heated seat issue. 10:37 A decent start for McLaren with the Red Bulls and Alonso chasing. Join us later for all the second practice action from Abu Dhabi.